James VI of Scotland/James I of England and Ireland (Charles James Stuart) (June 19, 1566 – March 27, 1625) was King of England, King of Ireland, and was the first to style himself King of Great Britain. He ruled in Scotland as James VI from July 24, 1567, until the death of Elizabeth I of England in 1603. Then from the "Union of the Crowns," in England and Ireland as James I, from March 24, 1603 until his death. He was the first monarch of England from the House of Stuart, succeeding the last Tudor monarch, Elizabeth I, who died without children. James was a successful monarch in Scotland, but the same was not true in England. He was unable to deal with a hostile Parliament; the refusal on the part of the House of Commons to impose sufficiently high taxes crippled the royal finances. His taste for political absolutism, his mismanagement of the kingdom's funds and his cultivation of unpopular favorites established the foundation for the English Civil War, during which James' son and successor, Charles I, was tried and executed. During James' own life, however, the governments of the kingdoms of England and the Scotland were relatively stable. Along with Alfred the Great, James is considered to have been one of the most intellectual and learned individuals ever to sit on the English or Scottish thrones. Under him, much of the cultural flourishing of Elizabethan England continued; science, literature and art, contributed by individuals such as Sir Francis Bacon and William Shakespeare grew by leaps and bounds during his reign. James himself was a talented scholar, writing works such as Daemonologie (1597), The True Law of Free Monarchies (1598), Basilikon Doron (1599) and A Counterblaste to Tobacco (1604). James was the only child of Mary I of Scotland and of her second husband, Henry Stuart, Duke of Albany, more commonly known as Lord Darnley. James was a direct descendant of Henry VII of England, through his great-grandmother Margaret Tudor, sister of Henry VIII. James' mother was an insecure ruler, as both she and her husband, being Roman Catholics, faced a rebellion of Protestant noblemen. Their marriage, furthermore, was a particularly difficult one. While Mary was pregnant with James, Lord Darnley secretly allied himself with the rebels and murdered the queen's private secretary, David Rizzio. James was born on June 19, 1566, at Edinburgh Castle, and automatically became Duke of Rothesay and Lord High Steward of Scotland, for he was the eldest son of the monarch and thus the heir-apparent. He received the name Charles James, the first name in honor of his godfather Charles IX of France, thus becoming the first future British monarch to have more than one forename. James' father was murdered with his rider and lover at the time on February 10, 1567, at the Hamiltons' house, Kirk o' Field, Edinburgh, most likely to avenge Rizzio's death. Mary's marriage on May 15 of the same year to James Hepburn, 4th Earl of Bothwell, who was widely suspected of murdering the Duke of Albany, made her even more unpopular. In June 1567, the Protestant rebels arrested Mary and imprisoned her in Loch Leven Castle. Mary was forced to abdicate the throne on July 24, giving it to James, then only 13 months old. James was formally crowned King of Scotland at the Church of the Holyrood, Stirling, on July 29, 1567. In deference to the religious beliefs of most of the Scots ruling class, he was brought up as a member of the protestant Church of Scotland and educated by men with Presbyterian sympathies. 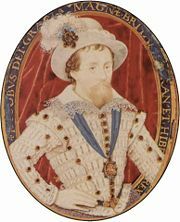 During James VI's early reign, power was held by a series of regents, the first of whom was James Stuart, 1st Earl of Moray, his mother's illegitimate half-brother. Mary escaped from prison in 1568, leading to a brief period of violence. Lord Moray defeated Mary's troops at the Battle of Langside, forcing her to flee to England, where she was captured and imprisoned by Elizabeth I.
Lord Moray was assassinated by one of Mary's supporters in 1570. He was succeeded by James' paternal grandfather, Matthew Stewart, 4th Earl of Lennox, who suffered a similar fate in 1571. The next was James VI's guardian, John Erskine, 1st Earl of Mar, who died in 1572. The last of the regents was James Douglas, 4th Earl of Morton, who, during the two previous regencies, had been the most powerful Scottish nobleman, more so than the previous regents. Historian and poet George Buchanan was responsible for James' education. Lord Morton was successful in finally crushing the families who continued to support Mary. His fall was brought about not by Mary's supporters, but by the King's closest courtiers, who impressed upon the young monarch the extent of the royal powers, thereby encouraging him to take control himself. The courtiers accused Lord Morton of participating in the murder of James' father. Lord Morton was consequently tried, convicted and then executed in 1581; power was thenceforth held by the King himself, rather than by a regent. Nevertheless, James VI did not rule by himself, relying instead on the advice of his closest courtiers. One of the most important noblemen at the time was James VI's cousin, Esmé Stewart, 1st Duke of Lennox, who had come from France in 1579, and who had been made Earl of Lennox. Another powerful courtier at the time was James Stuart, 1st Earl of Arran, who was created Earl of Arran as a reward for his testimony against Lord Morton. As Lord Lennox was a Catholic, and Lord Arran leaned towards Episcopalian, the Presbyterian Scottish Lords found the government distasteful. In the Raid of Ruthven (1582), some Presbyterian nobles, led by William Ruthven, 1st Earl of Gowrie, captured James and held him captive for almost a year at Ruthven Castle, now known as Huntingtower Castle, in Perthshire. Lord Arran was also detained, and Lord Lennox was banished to France. The king and Lord Arran escaped in 1583; Lord Gowrie was executed, and the rebels forced to flee to England. The Parliament of Scotland, loyal to the king, passed the Black Acts, putting the Church of Scotland directly under royal control. These Acts were extremely unpopular; his clergy opposed and denounced him, attempting to keep his influence under control, lest he grow so powerful as to be bold enough to disestablish Presbyterianism. James VI and Elizabeth I became allies under the Treaty of Berwick. James sought to remain in the favor of the unmarried Queen of England, as he was a potential successor to her Crown. Henry VIII had feared that the English crown would go to a Scot: in his will, he excluded Margaret Tudor, James' grandmother, and her descendants from the line of succession. Although technically excluded by the will—which, under an Act of Parliament, had the force of law—both Mary I of Scotland and James were serious claimants to the English crown, as they were Elizabeth I's closest relatives. Also in 1586, Mary was implicated in the Babington Plot, a scheme that sought to put her on the throne of England after murdering Elizabeth. Elizabeth had previously spared Mary's life after the Ridolfi plot, but could no longer tolerate the danger she posed. Consequently, Mary was executed for her crimes in 1587; but for the will of Henry VIII, James was now the Heir Presumptive to the English Crown. 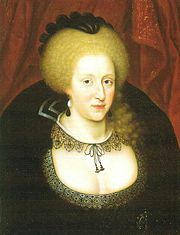 Anne of Denmark was James VI's wife. Following her execution, Mary's Scottish supporters became weak; James managed to significantly reduce the influence of the Roman Catholic nobles in Scotland. He further endeared himself to Protestants by marrying Anne of Denmark—a princess from a Protestant country and daughter of Frederick II of Denmark—by proxy in 1589. Another marriage, this time with both parties personally present, occurred on November 23, 1589, in the Old Bishops' Palace in Oslo during James' visit to the Kingdom of Denmark. Soon after his return via Leith on May 1, he attended the North Berwick Witch Trial, in which several people were convicted of having used witchcraft to create a storm in an attempt to sink the ship on which James and Anne had been traveling. This made him very concerned about the threat that witches and witchcraft were posing to himself and the country. During this period, he wrote the aforementioned treatise on demonology. As a result, hundreds of men and women were put to death for witchcraft; their bodies were later found in what was then called Nor Loch (now Princes Street Gardens). At first, James and his new queen were close, but gradually drifted apart. The couple produced eight children, three of whom survived infancy and one who was stillborn. They decided to live apart after the death of their daughter Sophia. James faced a Roman Catholic uprising in 1588, and was forced to reconcile with the Church of Scotland, at length agreeing to the repeal of the Black Acts in 1592. James, fearing that dealing too harshly with the Catholic rebels might anger many English Catholics, agreed to pardon some of his opponents, which angered the Protestant Church. In 1600 a conspiracy was formed by John Ruthven, 3rd Earl of Gowrie (son of the Earl of Gowrie, executed in 1584). Upon the failure of the plot, Lord Gowrie and his associates were executed, and even Protestant nobles began to be repressed by the king. Upon the death of Elizabeth I in 1603, under the terms of Henry's will, the crown technically should have passed to Lady Anne Stanley, a descendant of Henry VIII's sister Mary Tudor (queen consort of France). (Elizabeth's second cousin once-removed, Viscount Beauchamp, son of Lady Catherine Grey, was more senior, but he was considered illegitimate because his parents' marriage was annulled.) Nevertheless, James was the only serious claimant to the English crown: neither Beauchamp nor Lady Anne nor any other was powerful enough to defend a claim. Thus, an Accession Council met and proclaimed James King of England. He and his wife were crowned on July 25, 1603, at Westminster Abbey. Scotland and England remained separate states; it was not until 1707 that the Acts of Union merged the two nations to create a new state, the Kingdom of Great Britain. James' chief advisor was Robert Cecil, 1st Earl of Salisbury (the younger son of Elizabeth I's favored minister, William Cecil, 1st Baron Burghley), who was created Earl of Salisbury in 1605. James was an extravagant spender; only the skill of the Earl of Salisbury could avert financial disaster. He created numerous peerage dignities to reward his courtiers. In total, James, contrasted to his predecessor, Elizabeth, who had only created eight new peers during her 45-year reign, raised 62 individuals to the English Peerage. James also embroiled himself in numerous conflicts with Parliament. Being accustomed to a timid Parliament of Scotland, he did not like working with its more aggressive English counterpart. Before his accession to the English throne, he had written The True Law of Free Monarchies, in which he argued that the divine right of kings was sanctioned by the apostolic succession, and which illustrates James' difficulty in sharing the power of his government. Upon his arrival in London, James was almost immediately faced by religious conflicts in England; he was presented with the Millenary Petition, a document which it is claimed contained one thousand signatures, by Puritans requesting further Anglican Church reform. He accepted the invitation to a conference in Hampton Court, which was subsequently delayed due to the Bubonic Plague. In 1604 at the Hampton Court Conference, James was unwilling to agree to most of their demands. He did, however, agree to fulfill one request by authorizing an official translation of the Bible, which came to be known as the King James Version. During this year, James broadened Elizabeth's Witchcraft Act to bring the penalty of death without benefit of clergy to any one who invoked evil spirits or communed with familiar spirits. That same year, he ended England's involvement in the twenty-year conflict known as the Anglo-Spanish War by signing the Treaty of London, 1604. 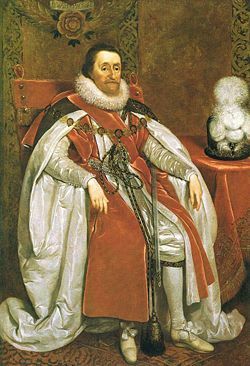 On October 20, 1604, James proclaimed himself styled "King of Great Britain," the first monarch to do so , although the United Kingdom of Great Britain would not exist until the Acts of Union, 1707. Though James was careful to accept Catholics in his realm, his Protestant subjects ensured that they would not get equal rights. In the early years of his reign, many of his subjects did not know his policies—only that he had an extreme Protestant background—there were a number of plots to remove him from power, such as the Bye Plot and the Main Plot. In 1605, a group of Catholic extremists led by Robert Catesby developed a plan, known as the Gunpowder Plot, to cause an explosion in the chamber of the House of Lords, where the king and members of both Houses of Parliament would be gathered for the State Opening of Parliament. The conspirators sought to replace James with his daughter, Elizabeth of Bohemia, whom, they hoped, could be forced to convert to Catholicism. One of the conspirators, however, leaked information regarding the plot, which was consequently foiled. Terrified, James refused to leave his residence for many days. Guy Fawkes, whose responsibility had been to execute the plot, was tortured on the rack until he revealed the identities of the other conspirators, all of whom were executed or killed during capture. Fawkes is still annually burned in effigy during Guy Fawkes Night (also known as Bonfire Night), celebrated in the United Kingdom, and New Zealand, to commemorate the failed plot. James' care not to strongly enforce anti-Catholic doctrine thereafter ensured that there were no more plots after 1605. In 1605, Parliament voted four subsidies to the king, who still considered this to be inadequate revenue. He imposed customs duties without parliamentary consent, although no monarch had taken so bold a step since the reign of Richard II of England (1377-1399). The legality of such an action was challenged in 1606 by the merchant John Bates; the Court of Exchequer, however, ruled in the king's favor. The decision of the court was denounced by Parliament. Relations between James I and Parliament were also soured by the latter's refusal to pass the king's plan to allow free trade between England and Scotland. In the last session of the first Parliament of his reign (which began in 1610), Lord Salisbury proposed the Great Contract, which would have led to the crown giving up feudal dues in return for an annual parliamentary subsidy. The plan, however, failed because of political factionalism in Parliament. Frustrated by the members of the House of Commons and by the collapse of the Great Contract, James dissolved Parliament in 1611. With the crown deep in debt, James blatantly sold honors and titles to raise funds. In 1611, he used letters patent to invent a completely new dignity: that of Baronet, which one could become upon the payment of £1,080. One could become a Baron for about £5,000, a Viscount for about £10,000, and an Earl for about £20,000. In 1607, at a royal jousting contest, seventeen-year-old Robert Carr, 1st Earl of Somerset, the son of Sir Thomas Carr or Kerr of Ferniehurst, was knocked from a horse and broke his leg. According to the Earl of Suffolk, Thomas Howard, James fell in love with the young man, and taught him Latin, and helped nurse him. His relationship remained strong with Carr for a number of years. Lord Salisbury died in 1612. Carr, another of the King's closest advisors, was forced to leave office after being disgraced by the Overbury Scandal. Thomas Overbury (1581-1613) was a poet whose The Wife (1614) embroiled him in a controversy about an affair between Carr and the Countess of Essex leading to his own imprisonment. In 1615, Carr and James had a falling out. James wrote a letter that year detailing a list of complaints he now had against Carr, including Carr withdrawing himself from James' chamber despite the King's "soliciting to the contrary." The following year Carr and his new wife were convicted of poisoning a prisoner in the Tower of London and sentenced to death, though the King later commuted the sentence to six years and then pardoned them and granted the pair a country estate. Following the loss of his closest advisors, James began to involve himself in matters previously handled by his ministers. James' personal government was disastrous for his finances, and a new Parliament had to be called in 1614 in order to obtain the imposition of new taxes. This Parliament, the second of James' reign, was known as the “Addled Parliament” because it failed to pass any legislation or impose any taxes. James angrily dissolved Parliament shortly thereafter, when it became clear that no progress could be made. Following the dissolution of the Addled Parliament, James ruled without a Parliament for seven years. Faced with financial difficulties due to the failure of Parliament to approve new taxes, James sought to enter into a profitable alliance with Spain by marrying his eldest surviving son, Charles, Prince of Wales, to the daughter of the king of Spain. The proposed alliance with a Roman Catholic kingdom was not well-received in Protestant England. James' unpopularity, furthermore, was augmented by the execution of Sir Walter Raleigh. In Scotland, James' attempt to move the church, whose form of worship tended to be based on free-form Calvinism, in a more structured High Church direction with the introduction of the Five Articles of Perth, met with widespread popular resistance. Always the practical politician in Scottish matters, the king, while insisting on the form of the law, did little to ensure its observance. James's paternalism (he was called the "Scottish Solomon" by Henri IV of France: a reference to James's wisdom, but also to the gossip attributing his paternity to David Rizzio, a secretary of James' mother) was based upon the Tudor model and seen as the most basic source or building block of political absolutism. This was consistent with the Tudor tradition of breaking with the old families of England, in order to sever the traditional Catholic ties in public affairs. The king saw himself superior in position to every subject, favorite or not—but did not hesitate to make unaligned people (those without special interests) feel special for the sake of getting potential allies into his favor. This philosophy is what earned the king his epithet "the wisest fool in Christendom" (Baldwin Smith). From 1618 onwards, the religious conflict known as the Thirty Years' War engulfed Europe. James was forced to become involved because his daughter, Elizabeth of Bohemia, was married to the Protestant Frederick V, Elector Palatine, one of the war's chief participants. He was also put under pressure to join the religious war because England, at the time, was one of the major protestant nations. When James' Spanish marriage plot failed, a humiliated Prince Charles and George Villiers, Duke of Buckingham, urged James and his parliament to go to war. From a financial perspective, James could not afford to go to war with Spain. James told Parliament that if they granted him the huge subsidy of £1,000,000, he would go to war. England eventually joined the war after James had died. During the conflict between Protestants and Catholics, James' attempt to ally himself with Catholic Spain via the Spanish Marriage plot fostered much distrust. James’ wife, Queen Anne, died on March 4, 1619, at Hampton Court Palace and was buried at Westminster Abbey. James I wore the insignia of the Order of the Garter for the above portrait by Daniel Mytens (1621). The third and penultimate Parliament of James' reign was summoned in 1621. The House of Commons agreed to grant James a small subsidy to signify their loyalty, but then, to the displeasure of the king, moved on to personal matters directly involving the king. Villiers, by now James' primary adviser, was attacked for his plan to have the Prince of Wales marry the Spanish Infanta. The practice of selling monopolies and other privileges was also deprecated. The House of Commons sought to impeach Francis Bacon, 1st Viscount St. Albans, who was implicated in the sale of such privileges during his service as Lord Chancellor, on charges of corruption. The House of Lords convicted Bacon, who was duly removed from office. Although the impeachment was the first in centuries, James did not oppose it, believing that sacrificing Bacon could help deflect parliamentary opposition. In the end, James released Bacon from prison and granted him a full pardon. A new constitutional dispute arose shortly thereafter. James was eager to aid his son-in-law, the Elector-Palatine, and requested Parliament for a subsidy. The House of Commons, in turn, requested that the king abandon the alliance with Spain. When James declared that the lower house had overstepped its bounds by offering unsolicited advice, the House of Commons passed a protest claiming that it had the right to debate any matter relating to the welfare of the kingdom. James ordered the protest torn out of the Commons Journal, and dissolved Parliament. In 1623, the Duke of Buckingham and Charles, the Prince of Wales, traveled to Madrid in an attempt to secure a marriage between the latter and the Infanta. They were snubbed, however, by the Spanish courtiers, who demanded that Charles convert to Roman Catholicism. They returned to England humiliated, and called for war with Spain. The Protestants backed them and James summoned Parliament, which granted some funding for the war. Parliament was prorogued, on the understanding that it would later return to grant more funds. Parliament, however, never actually met when scheduled. Charles had promised that even if he would marry a Roman Catholic, he would not repeal political restrictions that applied to Roman Catholics. When, however, he agreed to marry the Catholic French Princess, Henrietta Maria, he reneged on his earlier promise and undertook to abolish the same religious qualifications. Charles then ensured that Parliament did not actually meet, in order to avoid a confrontation over the diverging promises. James lapsed into senility during the last year of his reign. Real power passed to Charles and to the Duke of Buckingham, although James kept enough power to ensure that a new war with Spain did not occur while he was King. James died at Theobalds House in 1625 of 'tertian ague' (fever one day in every three), probably brought upon by kidney failure and stroke, and was buried in the Henry VII Lady Chapel in Westminster Abbey. Charles, Prince of Wales, succeeded him as Charles I. James had ruled in Scotland for almost sixty years; no English, Scottish or British monarch, with the exceptions of Victoria and George III, has surpassed his mark. Almost immediately after James I's death, Charles I became embroiled in disputes with Parliament. The disputes escalated until the English Civil War began during the 1640s; the monarchy was overthrown, and a military dictatorship established. The Stuart dynasty, however, was later restored in 1660. Some historians, particularly Whig historians, blame James for the Civil War. However, the general view now is that Charles I was more responsible for the state of affairs in 1640 than his predecessor. In the Virginia Colony in the New World, the Jamestown Settlement, established in 1607, and the James River were named in his honor. Traditionally, historians such as Samuel Rawson Gardiner and D. H. Wilson viewed James I as a poor king. This interpretation on James I had almost solely depended on the writings of Sir Anthony Weldon. James had previously dismissed Weldon for his writings against Scotland. Furious, Weldon wrote The Court and Character of King James, a book which would be notorious for influencing early twentieth-century historians who overlooked Weldon's bias. Recent historical revisionism has argued that James I was not a terrible king, contrary to popular belief. This revisionism effort originated from a study of James' ruling in Scotland by historians such as Gordon Donaldson and Jenny Wormald. Their argument was based on how James was so successful in Scotland, yet apparently quite unsuccessful in England. Revisionism of King James has restored his reputation as an unfortunate king who simply fell short of some of his greatest achievements. It was not until the 1970s that British and U.S. scholars began accepting this new outlook on James. Formally, James was styled "James, King of England, Scotland, Ireland, Fidei defender (Defender of the Faith), etc." (The claim to the Throne of France, which had been maintained since the reign of Edward III, was merely nominal.) By a proclamation of 1604, James assumed the style "James, King of Great Brittaine, France and Ireland, Defender of the Faith, etc." for non-statutory use. James' English arms, whilst he was King of England and Scotland, were: Quarterly, I and IV Grandquarterly, Azure three fleurs-de-lis Or (for France) and Gules three lions passant guardant in pale Or (for England); II Or a lion rampant within a treasure flory-counter-flory Gules (for Scotland); III Azure a harp Or stringed Argent (for Ireland). James also introduced the unicorn, a symbol of Scotland, as a heraldic supporter in his armorial achievement; the other supporter remained the English lion. In Scotland, his arms were: Quarterly, I and IV Grandquarterly, Or a lion rampant within a treasure flory-counter-flory Gules (for Scotland); II Azure three fleurs-de-lis Or (for France) and Gules three lions passant guardant in pale Or (for England); III Azure a harp Or stringed Argent (for Ireland), with one of the unicorns of Scotland being replaced as a heraldic supporter by a lion. Williamson, D. The Kings and Queens of England. New York: National Portrait Gallery, 1998. History of "James I of England"
This page was last modified on 16 March 2018, at 15:58.